Could rising aviation emissions be good for the environment? The international aviation sector is likely to require a substantial number of offsets to meet its goal of achieving carbon neutrality above a 2020 baseline. If these offsets are forestry related there is the possibility of generating substantial biodiversity co-benefits. 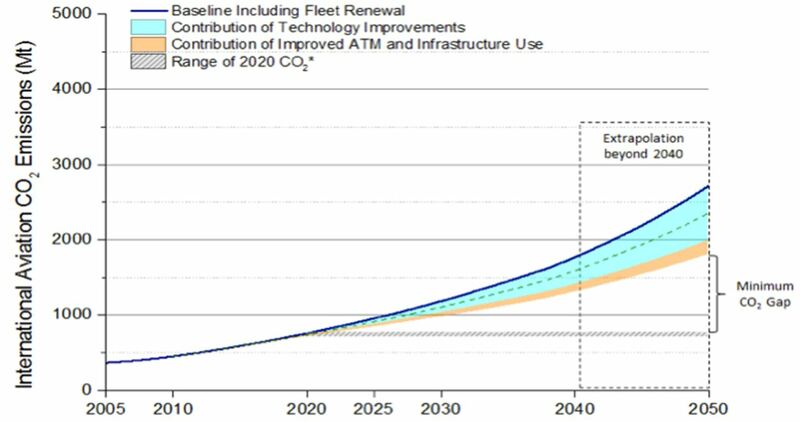 For this remaining emissions growth the only realistic option for capping net emissions at 2020 levels over the next few decades is likely to be the use of offsets. Demand for offsets from aviation could reach some hundreds of millions of tonnes p.a. in the 2030s, and this demand would be reliable as well as large, given the steady growth in demand. It could provide a much needed source of demand for international offsets, which is currently weak. The cost of this to passengers is likely to be small. Emissions from a transatlantic flight are very roughly around a tonne of CO2e per passenger, so this would add about $10 to the price of an economy class ticket assuming an offset price of $10/tonne, and less at current international offset prices, which are in the low single figures of dollars per tonne. One source of offsets that looks particularly promising is reduced emissions from deforestation and degradation (REDD). There has been a marked reduction in the rate of deforestation in Brazil (and some other jurisdictions) in the last decade, despite a slight increase last year. The reductions in Brazil have been achieved through a variety of measures, including improved monitoring by remote sensing, new legal frameworks with better enforcement, more intensive agriculture and so forth. But funding from governments, including Norway, Germany and the UK, has also played a useful role in reducing deforestation. Future programmes will likely benefit from the additional funding that REDD offsets can provide. , although this funding will never be enough on its own. And the scale of offsets available is potentially large. For example, 500 million tonnes p.a. is equivalent to avoiding over 8,500sq. km of Amazon forest loss each year, compared with about 5,800 sq. km of forest currently lost in the Amazon region of Brazil last year (and an average annual loss of about 11,500 sq. km over the last ten years). For a satisfactory scheme any offsets will of course need to be high quality, including meeting the usual tests of additionally, permanence and so forth, with adequate governance a prerequisite. Buffers, exchange rates or risk premiums may be necessary to account for residual risks around permanence, leakage and other factors, or to realise an explicit goal of generating net benefits, with (for illustration) 1.5 tonnes of REDD offsets required for every tonne of aviation emissions. This would somewhat increase the area protected for a given number of aviation emissions, assuming that REDD offsets are available at an appropriate price. REDD programmes have the advantage that they help conserve biodiversity. Indeed biodiversity benefits can be made an explicit criterion in programme design and selection. This may, for example, include building on the current Climate, Community and Biodiversity (CCB) standard that is widely used in voluntary markets. This would potentially allow an overall net gain for the environment if net carbon emissions were zero. Reduced emissions from deforestation would match increased airline emissions, and biodiversity would additionally be preserved – hence the (deliberately provocative) title of this post. Programmes can also provide opportunities for local communities, and the CCB standard is again relevant here. Indeed appropriate community involvement in projects, ensuring local communities also benefit, is likely to be essential to any successful REDD programme. Establishing that offsets issued now can be used after 2020 would provide valuable early demand for credits. However given the early stages of development of proposals by ICAO it may be difficult to attract investors at present. So far REDD has struggled to find adequate funding from carbon markets, despite discussion of allowing limited volumes of REDD credits under the California emissions scheme. And significant challenges remain in any circumstances. In particular, governance often remains difficult given the requirements for monitoring and permanence of REDD projects and programs. Eventually some technical solution will be needed to enable aviation emissions to be reduced at source. However in the meantime the chance to generate substantial additional benefits for biodiversity and other environmental goals by the judicious choice of forestry offsets to help meet aviation goals is an opportunity well worth further exploration. Thanks to Ruben Lubowski of Environmental Defense Fund for useful comments on this post. The 1 tonne CO2e per transatlantic flight per economy class passenger figure is indicative, and depends on the multiplier applied to the CO2 emissions to represent other atmospheric effects of emissions at altitude. This entry was posted in Climate change policy, emissions trading and tagged aviation, carbon pricing, climate change policy, decarbonisation, deforestation, emissions trading, emissions trading scheme, REDD on 10/07/2014 by adamwhitmore.